There's the famous line in Michael Lewis' "Moneyball" in which a frustrated Billy Beane, seeing his Oakland A's go down yet again in the postseason without reaching the World Series, says "My s--- doesn't work in the playoffs." Beane's teams have made the postseason eight times and won just one series. Cross the Bay Bridge and the San Francisco Giants made the playoffs three times in the past five seasons and won three World Series. None of those Giants teams were dominant in the regular season. The 2010 team won 92 games, the 2012 team 94 games but ranked just fifth in the National League in run differential, the 2014 team won 88 games and reached the postseason as the second wild card. Yet the Giants won nine consecutive playoff series, going an incredible 34-14, a winning percentage on par with the 1998 New York Yankees. Did the Giants figure out something that Beane never has? 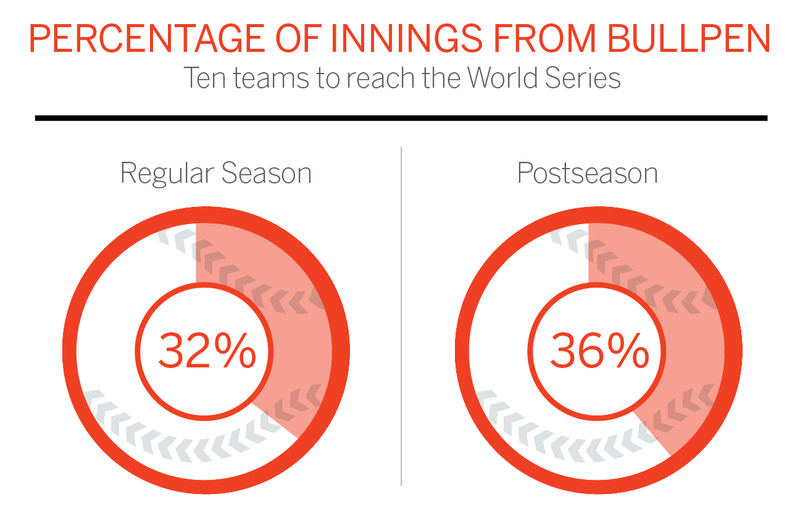 As the 2015 postseason begins, we ask: Is there really such thing as a postseason blueprint? In examining that question, I'm interested in what happens between the lines. No Giants voodoo magic was considered, even if such a thing does exist. Nothing about clubhouse leadership or experience, which are difficult to quantify. I checked the past five postseasons. That's admittedly too small of a sample size and it's possible what worked in recent years won't work as well in future years, especially since the data will be biased toward what worked for the Giants. The game is constantly evolving. That's one reason I went back just to 2010. That's when the strike zone started increasing in size and offense began to decline (although it picked up slightly this season). So the numbers seem pretty decisive here: Put the ball in play and good things will happen. Keep in mind that you're facing better pitching in the postseason. From 2010-2014, the strikeout percentage in the playoffs was 21.7 percent compared to 19.4 percent in the regular season. The batting average dropped from .254 to .236 and BABIP from .297 to .283. In their three playoff seasons, the Giants' wOBA was .297 compared to .298 for all playoff teams, so they haven't necessarily been an offensive powerhouse. They've hit just .243. But with runners in scoring position, they raised their average to .256 and their wOBA to .329. With a runner on third, they've hit .276 and cut their strikeout rate to 15.1 percent. The Royals hit .362 last October with a runner on third and .294 with runners in scoring position. The emphasis on contact has helped both teams in RBI situations. 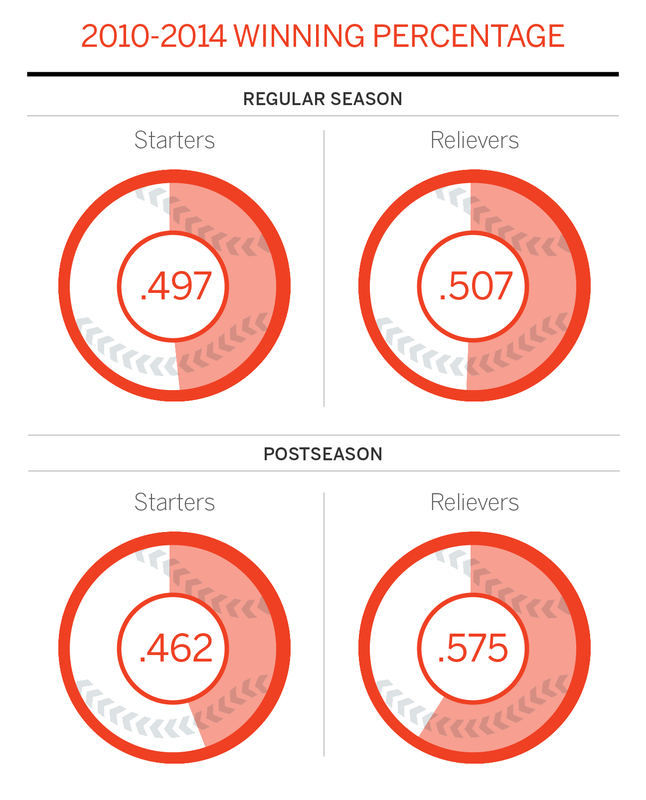 The team with the highest strikeout rate in the playoffs since 2010? The A's, at 29.8 percent over 11 games. So home runs are overrated. Well, we just ran the numbers above. The weird thing is that home runs in the playoffs (again, the past five postseasons only) have matched the frequency of home runs in the regular season. The Giants certainly haven't powered their way to World Series titles, although some of that is a reflection of their pitcher-friendly ballpark. They've homered once every 48.2 at-bats in the postseason -- actually less than their regular-season rate during their playoff seasons. They hit 34 home runs in their postseasons and allowed 35. Now, this doesn't mean going yard is bad. The Red Sox hit the second-most home runs of the 2013 playoff teams, outhomered their opponents in the American League Championship Series and World Series and won it all. The Orioles outhomered the Royals 211 to 95 in the regular season last year but the Royals outhomered them in sweeping the ALCS. But the lust for long balls shouldn't come at the expense of strikeouts or good situational hitting. In fact, none of the teams who led the playoff teams in home runs reached the World Series (2010 Yankees, 2011 Yankees, 2012 Yankees, 2013 A's, 2014 Orioles). None of the top National League teams reached the World Series either (2010 Reds, 2011 Brewers, 2012 Nationals, 2013 Braves, 2014 Nationals). Use your bullpen, early and often. If there's one strategy about the posteason you'll see statheads get worked up more than any other, it's this one. Here's the reason why: Starting pitchers don't fare as well as they start going through the lineup a second and third time. Why stick with a tiring starter when you can go to a reliever, often one who throws 95 mph? Or you can mix and match to get the platoon advantage. Plus, with the extra off days during the playoffs, you don't have to worry about burning out your bullpen to the same extent as in the regular season. Bochy hasn't been perfect in this regard -- Peavy lost a World Series game last year when he gave up two runs in the sixth when the game was tied -- but Bochy generally never lets a starter lose a game in the middle innings. Think back to Bob Melvin letting Jon Lester face the Royals a fourth time through the order in last year's wild-card game as the A's blew a 7-3 with Lester allowing six runs. Or Jordan Zimmermann trying to hold a 1-0 lead against the Giants in ninth inning of a division series game. Or Clayton Kershaw twice losing leads in the seventh inning against the Cardinals. Go to the bullpen. Hope they do the job. 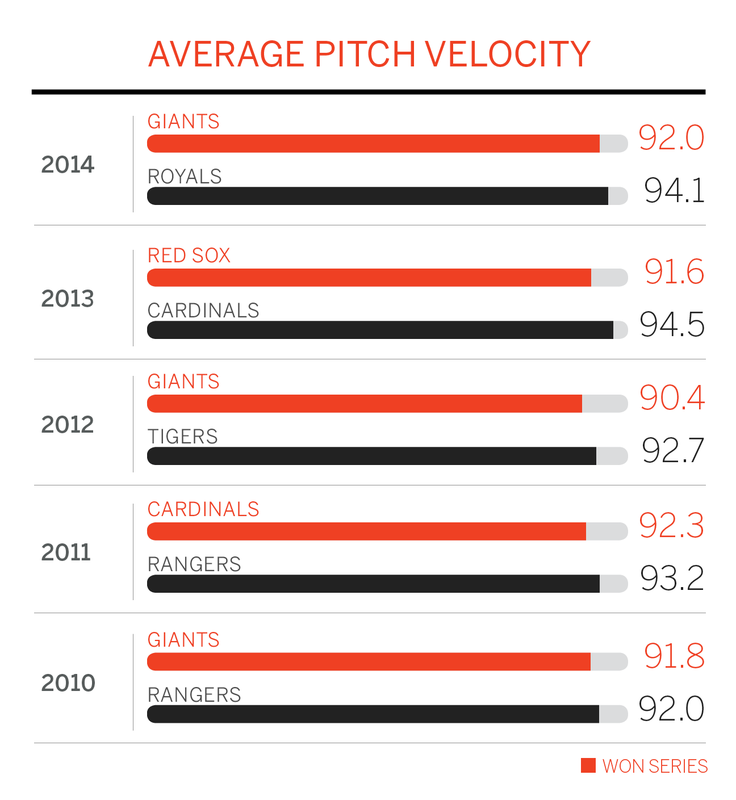 Does all this mean that starting pitching in the postseason is overrated? Yes -- and no. The thing is, sometimes that starter is a Bumgarner or Verlander or Lincecum, but sometimes it's an untested rookie like Wacha, a veteran having a so-so season like Lester (he had a 3.75 ERA in 2013) or a mid-rotation starter like Vogelsong. And sometimes it's Colby Lewis. The last team to lead the majors in starters' ERA during the regular season and win the World Series? The 1995 Braves. In other words, having a season's worth of gems from your rotation guarantees nothing in October -- maybe bad news for all five NL playoff teams, who rank 1-5 in the majors in rotation ERA. But here's an indicator that may help: In looking for which pitchers may come up big in October, it appears a strong finish is important. Bumgarner had a 2.12 ERA the final two months of 2014, Lester had a 2.22 ERA over his final eight starts in 2013, Vogelsong allowed one earned run his final three starts in 2012, Carpenter had a 3.45 ERA in 2011 but 1.13 over his final five outings. So who is hot (and who is not) entering this postseason? Chicago's Jake Arrieta's 0.41 ERA over final two months is historically dominant. Los Angeles' Clayton Kershaw owns a 1.25 ERA since July 3 and Toronto's David Price went 5-0, 2.32 ERA in September. The Cardinals lead in rotation ERA at 2.99 but are at 4.01 since September 1, with Michael Wacha owning a 7.88 ERA in September and Lance Lynn a 4.75. New York's Jacob deGrom has a 4.50 ERA the final month and Kansas City's Johnny Cueto has a 6.99 ERA over his past eight starts. Our man Bumgarner? His average fastball velocity last postseason was 92.9 mph, which ranked 12th out of 26 postseason starters (although that was an increase from his 92.0 average from the regular season). 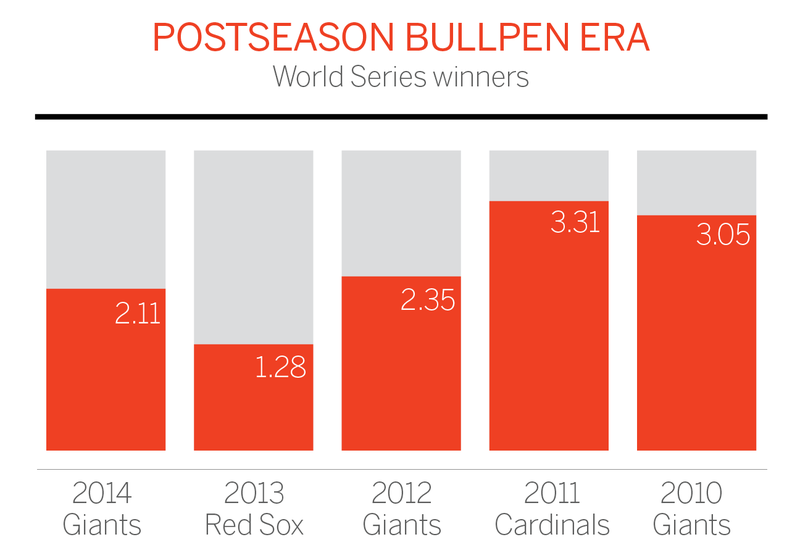 The Giants have relied on guys such as Sergio Romo and Yusmeiro Petit during the playoff runs. Barry Zito outpitched Justin Verlander in the first game of the 2012 World Series. Koji Uehara saved seven games for the Red Sox in 2013 throwing an upper-80s fastball and splitter. Maybe when the chips are down, it's those crafty veterans throwing in the low 90s and situational relievers who win you World Series. We know the playoffs are unpredictable. 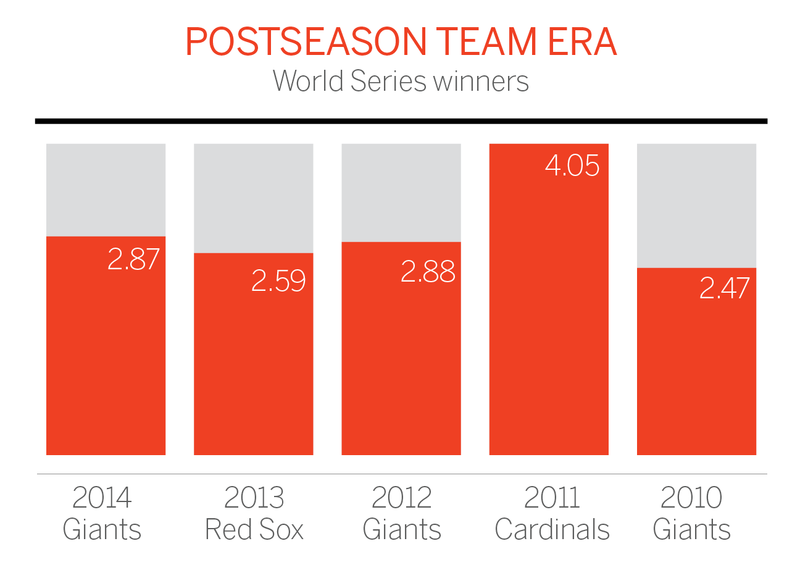 After all, last season we had two wild-card teams reach the World Series.The Giants won even though Buster Posey, their best hitter, didn't have an extra-base hit the entire postseason and hit .154 in the World Series. But there are a few strategies that seem to work: Battle pitchers with two strikes and put the ball in play; turn the game over to your bullpen in those middle innings; rely on one starting pitcher if you have to; get some big home runs from unlikely heroes along the way. And maybe hope you have a starting pitcher who can throw five innings of relief on two days' rest in Game 7 of the World Series.